(February 4, 2011) --- Leave your towels at home. 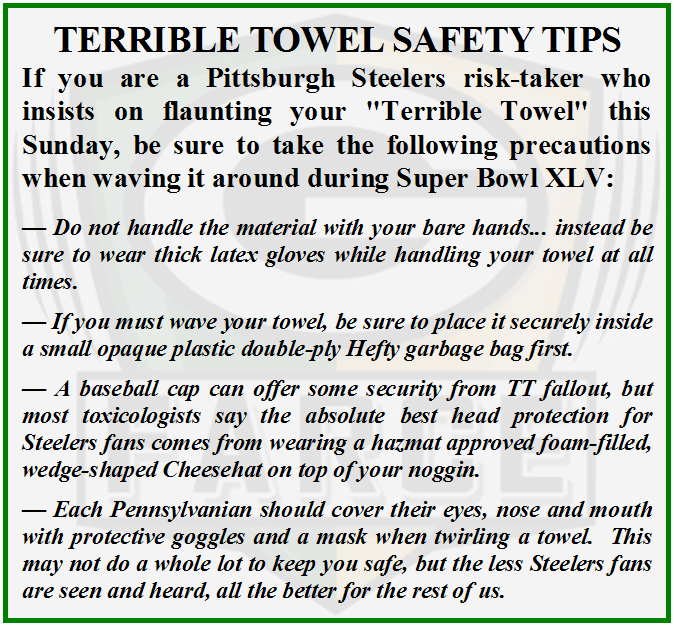 That's the advice coming from the NFL which is looking into recent reports that thousands of tainted "Terrible Towels" may already be in the hands of Super Bowl bound Pittsburgh Steelers fans. 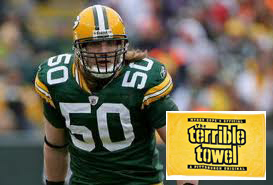 Sure, AJ Hawk would love to see Pittsburgh's famed towel during the Super Bowl this Sunday. In fact, he hopes the Steelers throw it in early. A "Terrible Towel" is a small yellow-colored parcel of cloth resembling an ordinary bathroom hand towel which has the words "Terrible Towel" printed in black on one side and has been used by Steelers fans over the past three-decades in an effort to excite each other and their team before and during games. 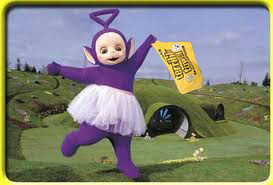 Then, after games the towelettes are often used by despondent Pittsburgh fans to wipe away their tears. Apparently a huge batch of "Terrible Towels," estimated to number in the thousands, were found to contain various amounts of toxic chemicals such as mortifates and humilitants with trace amounts of chagrinium. And although they appear to be innocent and even dainty looking, these pieces of yellow cloth could cause long-lasting psychological problems if not properly disposed of or immediately destroyed. 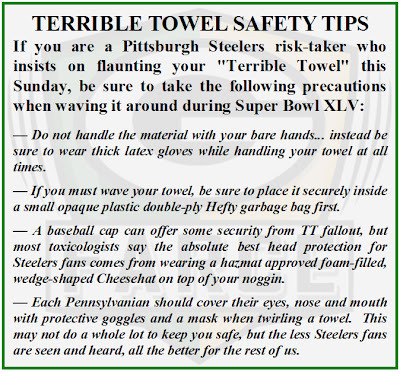 The fear is that unsuspecting Steelers fans will bring these tawdry towels into Cowboys Stadium this Sunday for Super Bowl XLV and unintentionally embarrass themselves and others who happen to sit nearby. According to a spokesperson for the Consumer Product Safety Commission, the real problem occurs when Steelers fans begin twirling their brightly colored hankies over their heads. "This is a bad idea," said Kenny Schmeltzer of the CPSC who spent months testing the towels. "Not only does it look extremely gay, but the toxins from the paint on the material could easily flake off and make contact with someone's skin, hair or beverage and may result in short-term memory loss, hives, stupidity or short-term memory loss." Follwing months and months of tests, the Consumer Product Safety Commission has concluded that waving a "Terrible Towel" can result in a drastic loss of machismo in men. ﻿The CPSC also warns Pennsylvania football fans that, like their Steelers, the “Terrible Towels” have a better than good opportunity to become a choking hazard this Sunday. But with the big game just around the corner, the NFL is hoping against all odds that Steelers fans will get smart and trash their “Terrible Towels” before Super Sunday.